I love great cake gags, cake fights and cake catastrophes in the movies! One of my favorite cake scenes in a movie is when a very young Debbie Reynolds pops out of a cake to the surprise of Gene Kelly in “Singing in the Rain”. Another favorite is the exploding cake scene from the Three Stooges 57th short subject film “An Ache in Every Stake” – The Stooges, acting the part of bakers, are trying to bake a birthday cake. When their cake collapses, they use the oven’s gas line to re-inflate it creating a huge gas bag. The cake literally explodes in everyone’s faces when the candles are blown out! 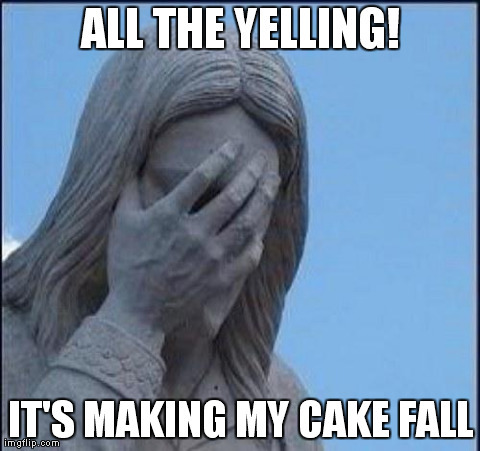 The timing of my last article dealing with a plastic baby Jesus in a cake was amazing to me, what with all the talk lately about this controversy surrounding Indiana’s attempts at enacting their state’s version of a Religious Freedom Restoration Act (RFRA) law, an Indiana cake bakery, a pizza shop and members of the LGBTQ community. I remember President Bill Clinton signed the RFRA into law in 1993, and then the US Supreme Court held RFRA was unconstitutional as applied to the states because it was not a proper exercise of Congress’s enforcement power in accordance with the Fourteenth Amendment to the US Constitution. Many states have since passed RFRA laws of their own. I glanced over the Federal RFRA and Indiana’s version a couple of times and didn’t see anything in them about sexual orientation, gender identification, cake or pizza. I DID find language limiting the state’s (and Fed’s) ability to interfere with a person’s exercise of their religious beliefs unless there was “a compelling reason” to interfere. I’m thinking a madrasah teaching Jihad on US soil would constitute “a compelling reason”, but that’s for another article. We’re worried about cake right now. “A compelling reason”; now that’s an interesting idiom. Can one be compelled without a reason? Can one have a reason for their actions without being compelled? Compel is a transitive verb – an action word. Merriam-Webster defines “compel” as; to drive or urge forcefully or irresistibly – or – to cause to do, or occur, by overwhelming pressure. What would cause a gay couple to pass on bakeries or cafes they frequent and instead chose to compel a known Christian owned bakery to make them a wedding cake, knowing that baker probably cannot, in good faith, endorse gay marriage? On the flip side, does baking a cake for a gay couple constitute an endorsement of their behaviors and beliefs or does it simply showcase a baker’s talent? Does a cake really define one’s religious conviction? Consistency in behavior and motivation says a lot about a person. It was Ralph Waldo Emerson who wrote “a foolish consistency is the hobgoblin of little minds”. This entry was posted in Uncategorized and tagged Beliefs, Bill Clinton, Business Owners, Cake, Christians, Convictions, Debbie Reynolds, Film Shorts, Gay Marriage, Gender Identificaion, Gene Kelly, God, Indiana, Jesus, Jihad, LGBTQ, Madrasah, Perfect Love, Pizza, Ralph Waldo Emmerson, Religious Convictions, Religious Freedom, RFRA, Servant Heart, Sexual Orientation, Singing in the Rain, Social Pressure, Supreme Court, The Apostle Paul, The Three Stooges, US Constitution, Water to Wine. Bookmark the permalink.